It was another eventful year. 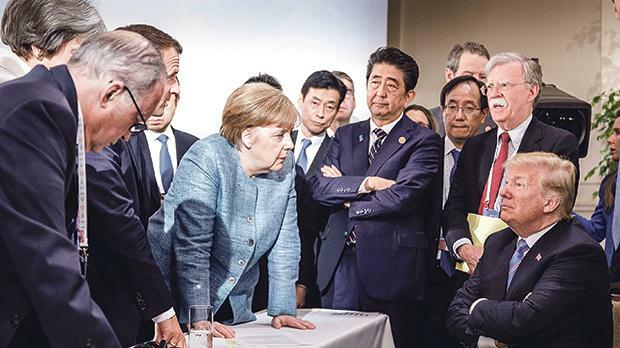 In the United States, President Donald Trump’s Republican Party lost control of the House of Representatives, Angela Merkel stepped down as leader of her Christian Democratic Union, Italy got a populist coalition government and Brexit dominated the EU and UK agenda. The Democratic Party’s capture of the House of Representatives in the US mid-term elections ended Trump’s unchecked hold on power and paves the way for his possible impeachment. In 2018 Trump intensified his undermining of the free press and the rule of law, his demonising of migrants, his constant lying and his so-called ‘America First’ policy. Once again the Trump administration had a very high turnover, with 12 senior officials resigning or being sacked. The resignation of Defence Secretary James Mattis over Trump’s Syria policy removed an important voice of moderation in the administration. Trump continued to ignore calls for gun control after a number of mass shootings and he remained in denial about climate change, even saying he did not believe his own government’s report about the threat of global warming. Trump’s insistence on building a wall with Mexico, and his inability to get funding for it, led to a partial government shutdown. On the international front Trump continued to move America away from the multilateral world order: he withdrew from the Iran nuclear deal and the UN Human Rights Council, he moved the US Embassy to Jerusalem, he ended all aid to the Palestinians and he imposed tariffs on key US trading partners such as the EU, South Korea, China, Mexico and Canada. The Robert Muller investigation into Russian interference in the 2016 presidential election progressed. Trump’s former lawyer Michael Cohen was jailed for three years for lying to Congress about a Trump property deal in Moscow during that election, as well as for campaign finance violations when he made hush money payments to women who had affairs with Trump. And ex-Trump campaign chief Paul Manafort – who was convicted of fraud related to his consulting work years earlier for a pro-Russia political party in Ukraine – will be sentenced next February. Relations between the US and Russia remained frosty and Trump announced Washington’s withdrawal from the landmark 1987 Intermediate-Range Nuclear Forces Treaty because he said Moscow violated it. Trump, however, defended Russia over claims of interference in the 2016 presidential election during a Helsinki summit with President Vladimir Putin, contradicting US intelligence agencies. His comments caused an uproar and the day after he was forced to retract what he said. Putin was re-elected Russia’s President in a landslide victory, receiving 76 per cent of the vote, amid claims of voting irregularities. The main Opposition leader, Alexei Navalny, was barred from the race due to a fraud conviction which he says was a frame-up, freedom of expression continued to be curtailed and a servile State-media machine made it very difficult for anyone to effectively challenge Putin. Russia persisted in supporting fake news in an attempt to cause division in the West and undermine liberal values. The EU in fact launched a “war against disinformation” spread by the Kremlin in an attempt to protect next year’s European Parliament elections. Moscow’s relations with the West further deteriorated after Russian coastguard ships opened fire on three Ukrainian ships and seized their crews as they sailed off the coast of Russian-annexed Crimea between the Black Sea and the Sea of Azov. Russia’s relations with the UK also plummeted after dissident Sergei Skripal and his daughter Yulia were poisoned by Russian intelligence officers using a nerve gas agent in Sailsbury, England. Both survived. The two Koreas marched together at the Winter Olympics and the Presidents of North and South Korea, Kim Jong-un and Moon Jae-in, met three times. Kim and Moon pledged to work towards the denuclearisation of the Korean peninsula – although Kim did not explicitly agree to give up the North’s nuclear weapons – and to convert the Korean Armistice Agreement into a full peace treaty. In June a historic summit between Donald Trump and Kim Jong-un took place in Singapore – the first ever meeting between a sitting US President and a North Korean leader. The two signed a joint statement which agreed to security guarantees for North Korea, new peaceful relations and the denuclearisation of the Korean Peninsula. After the summit Trump announced the US would discontinue “provocative” joint military exercises with South Korea, taking both Seoul and his close aides by surprise. So far, there has been no progress towards denuclearisation by North Korea. Chinese President Xi Jinping consolidated his hold on power after the National People’s Congress approved the removal of the two-term limit on the presidency, effectively allowing him to remain in power for life. Unfortunately, during the last year China-US relations deteriorated rapidly due to a number of reasons, including trade, the South China Sea and Taiwan. Brexit very much dominated the EU’s agenda, as well as the UK’s political scene. A deal was reached last month governing Britain’s exit from the bloc which includes a temporary EU-UK Customs Union until a solution on the hard border between Northern Ireland and Ireland is found, a transitional period for almost two years after Brexit and guarantees for EU citizens in the UK and vice-versa during this phase. In the UK Parliament there was widespread opposition to the EU deal, both form Brexiteers and Remainers, and Prime Minister Theresa May, whose Conservative government had been weakened by a string of high-profile resignations, postponed the vote on the accord, hoping to get ‘clarifications’ from the EU. May, meanwhile, faced a Conservative Party leadership challenge, which she won, but one-third of her MPs voted against her. Weakened, she declared she would not be party leader at the next election due in 2022. Migration remained a hot political issue in Europe, as gains for right-wing populist parties in a number of regional and national elections showed, even though the number of migrant arrivals via the Mediterranean decreased by 90 per cent since 2015. The EU agreed to a migration deal at its June summit which included sending rescued migrants on EU territory to ‘control centres’ across the bloc. In other EU developments Brussels and Japan signed a free trade agreement and the bloc announced it created a system to allow European companies that trade with Iran to bypass newly re-imposed US sanctions. In Germany, another ‘grand coalition’ was formed between Angela’s Merkel’s Christian Democrats (CDU/CSU) and the Social Democrats (SPD) after last year’s inconclusive elections. Throughout the year both parties lost ground in a number of regional elections, mainly to the anti-migrant right-wing Alternative for Germany. Merkel decided to step down as CDU leader (but not as Chancellor) after her party’s poor performance in October’s election in the state of Hesse, and she also announced she would not seek re-election as Chancellor when her term ends in 2021. Earlier this month the CDU elected Annegret Kramp-Karrenbauer as Merkel’s replacement. Kramp-Karrenbauer, Merkel’s protégé, is a former state premier of Saarland, and has a talent for striking alliances with other parties. Matteo Salvino became Italy’s Interior Minister in the country’s new populist coalition government. In Italy, no electoral bloc or single party won a majority of seats in March’s general election. 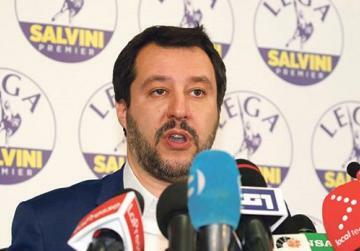 A ‘populist right-wing’ coalition was formed between the Five Star (the largest party) headed by Luigi Di Maio, and the right-wing League, (the largest party in the centre-right alliance, which was the largest bloc), headed by Matteo Salvini, causing ripples in Brussels. As a compromise between the two parties, Giuseppe Conte, a little-known soft-spoken academic, was chosen as Prime Minister. Salvini and Di Maio were both made deputy prime ministers, in addition to their ministerial portfolios. Despite much rhetoric, however, the new Italian government remained largely pro-European, even though Interior Minister Salvini adopted a hardline stand on migration. On economic policy, largely the remit of Economic Development and Labour Minister Di Maio, the government’s spending plans did cause unease in Brussels which demanded changes to Italy’s budget plans because of the country’s high debt. After some hesitation by Rome a budget deal was reached which lowered the planned deficit from 2.4 per cent to 2.04 per cent. In Sweden, also, no electoral bloc achieved a majority of seats in the country’s election, with the right-wing anti-migrant Sweden Democrats holding the balance of power. Sweden’s Social Democrat Prime Minister Stefan Lofven, whose bloc got one seat more than the centre-right Opposition, lost a number of confidence votes in Parliament since the September election, and still heads a caretaker government. In Spain, the Conservative government led by Mariano Rajoy was defeated in a no-confidence vote in Parliament following a court ruling over a corruption case involving former senior officials of his Popular Party. Rajoy was replaced as Prime Minister by Socialist leader Pedro Sánchez who adopted a more migrant-friendly policy. Sánchez also offered a softer approach towards the Catalan question, proposing a referendum in the region on greater autonomy – but not independence. The Popular Party chose the right-wing Pablo Cassado as its new leader. In France, President Emmanuel Macron fared badly in the opinion polls, despite presiding over a number of important reforms, such as reducing the government’s role in the economy and making the labour market more flexible. However, Macron had a number of communication mishaps and high profile Cabinet resignations and he is seen by many as being detached from the everyday lives of ordinary people. Macron dropped a proposed tax increase on fuel after weeks of violent protests in Paris. He also cancelled planned increases in gas and electricity prices and announced a €100 a month minimum wage increase. Poland and Hungary both continued to clash with the European Commission over their undermining of the rule of law and of EU values. However, the Polish right-wing government moved to reinstate Supreme Court justices whom it had forced into early retirement, after a ruling by European Court of Justice which ordered Poland to suspend its new law. In Hungary, Victor Orban’s right-wing populist Fidesz party was re-elected by a landslide, increasing its share of the vote to slightly over 49 per cent and winning two-thirds of Parliament’s seats. It nearest rival, Jobbik, a far-right nationalist party, got 19 per cent, meaning that 68 per cent of Hungarians voted for right-wing, eurosceptic, populist parties. In September the European Parliament voted to take disciplinary action against Hungary over alleged breaches of the EU’s core values. The decision to sanction Budapest now rests with the EU Member States. The Middle East peace process went absolutely nowhere, Israel continued to build illegal settlements in the occupied territories, Hamas in Gaza and Israel continued attacking each other and the opening of the US Embassy in Jerusalem further eroded Washington’s trust among Palestinians. The US State Department did not even attempt to get the peace process started again, a task left to President Trump’s inexperienced son-in-law Jared Kushner, who still has to come out with a plan. The world was shocked by the brutal murder of Saudi journalist Jamal Khashoggi in his country’s consulate in Istanbul. The Saudis insisted Khashoggi, a well-known critic of the Saudi government who wrote a column in the Washington Post, was killed on the orders of a rogue intelligence officer, and made a number of arrests. However, Turkey said it has evidence that he was murdered by Saudi agents acting on orders of the Saudi government. And the US media reported the CIA believed the killing was ordered by Crown Prince Mohammed bin Salman. Although President Trump continued to defend the Crown Prince, the US Senate voted unanimously to blame the latter for Khashoggi’s murder. In Yemen, the country’s brutal, but largely ignored, war intensified with absolutely horrifying statistics. Besides thousands of civilians and combatants being killed since the conflict began – more than half caused by Saudi-led coalition air strikes – thousands more have died from malnutrition, disease and poor health. Earlier this month the UN said Yemen was descending towards famine with 20 million Yemenis being “food insecure”. The conflict continued to be a regional power struggle between Iran, which is accused of backing the Shi’ite Houthi rebels, and Saudi Arabia, which supports the government of President Abdrabbuh Mansur Hadi. A slight glimmer of hope emerged recently after the warring parties agreed to a ceasefire after talks in Sweden. It was another year of war in Syria, where the regime of Bashar al-Assad supported by the Russian military continued to recapture territory from various rebel groups, both jihadist and non-jihadist, leading to many civilian casualties. The so-called Islamic State continued to lose areas it once controlled, largely as a result of action taken by US-Kurdish forces. To complicate matters, Turkish troops and allied Syrian rebels (Free Syrian Army) captured Afrin, a Kurdish enclave, where they confronted a US-backed Kurdish group. And in April the US, UK and France launched air strikes targeting chemical weapons facilities near Damascus and Homs in response to a chemical weapons attack in Douma. The situation in the country threatened to further escalate when after a series of Israeli strikes on the Iranian military in Syria, Iran shelled the Golan Heights from Syrian territory, leading to further Israeli strikes against Iranian positions in Syria. Earlier this month, US President Trump, in a major foreign policy blunder, announced that all US troops from Syria are to be withdrawn shortly, claiming IS had been defeated. This was refuted not only by countries such as the UK and France, but also many of the President’s Republican allies in Congress, all of whom claimed such a move could lead to a resurgence of IS, a victory for Assad, Russia and Iran, and would be a betrayal of the Kurds, US allies who fought so hard to defeat IS. In Egypt a sham election was held in which President Abdel Fattah al-Sisi was re-elected with 97 per cent of votes, and which featured only one Opposition candidate – himself an ardent Sisi supporter. In Libya the situation remained fragile. Elections planned for December were cancelled and a meeting in Palermo last month attended by the warring parties agreed to hold a poll in 2019. There was bad news in Brazil when far-right politician Jair Bolsonaro won a comfortable victory in the presidential election, receiving 55.2 per cent of the vote. Bolsonaro, who takes office next month, is a polarising politician who has praised Brazil’s former military dictatorship, supports torture and backs development in the Amazon. His Social Liberal Party, however, only has 52 seats out of the 513 seats in the lower house of Congress. Armenia’s Acting Prime Minister Nikol Pashinyan won a huge victory in the country’s parliamentary election. Pashinyan, who spearheaded a peaceful anti-corruption ‘Velvet Revolution’ in April, promised to remain friends with Russia while stepping up co-operation with the US and the EU. In Turkey President Recep Tayyip Erdogan won a new five-year term after winning 52.5 per cent of the vote in the presidential election. Erdogan’s AK Party, together with its right-wing ally, the MHP, also won a majority in the parliamentary election. The poll was criticised by foreign observers who remarked that the election was held under a state of emergency, with the State media heavily biased in favour of Erdogan and a large number of journalists and Opposition activists and politicians in jail. Nuclear-armed Pakistan got a new Prime Minister, Imran Khan, a former cricket hero, amid accusations of vote rigging by rivals. US-Pakistani relations remained cool, especially after the Trump administration suspended US military aid to Pakistan amid claims that Islamabad was no doing enough to combat the Afghan Taliban and other Islamist militant groups operating from its territory. The Taliban, meanwhile, continued its offensive in Afghanistan, and now controls 60 per cent of the country. A parliamentary election was held in October in Afghanistan, and the results have not yet been announced. Meanwhile it was reported that Trump is planning to withdraw more than 5,000 of the 14,000 US troops in Afghanistan, a move criticised by not only national security experts but also the President’s own Republicans. Islamist terrorism continued throughout the year with attacks by the so-called Islamic State, al-Qaeda or their affiliates, mainly in the Muslim world, and especially in Afghanistan, Pakistan, Nigeria, Somalia, Yemen, Iraq, Egypt, Niger and Mali. In Iraq hundreds of mass graves were discovered containing thousands of bodies in areas once controlled by the Islamic State. There were four isolated incidents involving ‘lone wolf’ attacks in France, Belgium and the Netherlands. And last week two Scandinavian tourists were murdered by jihadists in Morocco. United Nations investigators said Myanmar’s military carried out mass killings and gang rapes of Muslim Rohingya with “genocidal intent” in 2017, and that the commander-in-chief and five generals should be prosecuted for crimes under international law. Amnesty International, meanwhile, announced it had withdrawn its highest honour, the Ambassador of Conscience Award, from Myanmar’s de facto civilian leader, Aung San Suu Kyi, in light of the Myanmar leader’s “shameful betrayal of the values she once stood for”. Meanwhile in Mexico Andrés Manuel López Obrador of the left-wing Morena party won Mexico’s presidential election with 53 per cent of the vote, promising “profound change” and to clamp down on corruption. The ruling Institutional Revolutionary Party candidate came a poor third with 16.4 per cent. In Venezuela the country’s political and economic crisis deepened, inflation reached 1,000,000 per cent and the doctrinaire far-left Socialist President Nicolás Maduro was ‘re-elected’ in a sham election boycotted by most Opposition candidates. Suppression of the media and Opposition continued all year. A UN Human Rights Council report said Venezuelan security forces had carried out hundreds of random killings under the guise of fighting crime, adding that the rule of law was “virtually absent” in the country. In Nicaragua, too, the left-wing Sandinista government clamped down ruthlessly on protests against the government of President Daniel Ortega, leading to the deaths of many protesters. And in Colombia the centre-right slightly populist Iván Duque was elected President by a large margin, promising to change aspects of the country’s historic peace deal with the Farc rebel group. So far the peace accord has remained in place. In Zimbabwe, President Emmerson Mnangagwa of the Zanu-PF party was declared the winner of the first election since the ousting of Robert Mugabe. Zanu-PF also won the parliamentary vote. The Opposition MDC Alliance led by Nelson Chamisa dismissed the country’s election results as “fraudulent” and challenged them in court, which rejected the claim. In South Africa, President Jacob Zuma resigned after his own party, the ruling ANC, told him to step down or face a vote of no confidence in Parliament. Zuma faced numerous allegations of corruption and presided over soaring unemployment. He was replaced as President by Cyril Ramaphosa, his deputy and ANC leader. Two months after his resignation Zuma was charged with corruption linked to a 1990s arms deal. There were encouraging signs in Ethiopia when Hailemariam Desalegn resigned as Prime Minister amid a wave of anti-government protests. His successor, Abiy Ahmed, freed thousands of political detainees, including Opposition leader Andargachew Tsege, lifted a state of emergency and declared the end of war with Eritrea – and reopened the land border with its neighbour after giving up disputed territory. In the Democratic Republic of Congo, today’s long-delayed presidential election was postponed until March in three areas due to insecurity and an Ebola outbreak, meaning a million votes will be ignored – as a new president is due to be sworn in by the middle of January. Joseph Kabila, who has been President since January 2001, is backing former interior minister Emmanuel Ramazani Shadary in the election. The main Opposition challenger is Martin Fayulu, a former Exxon Mobil manager. In Malaysia former prime minister Mahathir Mohamad, aged 92, won a historic victory in the country’s parliamentary elections. His Opposition Pakatan Harapan alliance defeated the Barisan Nasional coalition, which he was once part of, led by his former protégé Najib Razak, who was plagued by corruption allegations. Mr Mahathir became the oldest elected leader in the world and said he wanted to restore the rule of law. Australia got yet another new prime minister when Malcolm Tunbull was ousted by his own Liberal Party and replaced by Scott Morrison, the country’s sixth prime minister since 2007. Nearly 200 countries overcame political divisions to agree on rules for implementing the Paris climate accord, but critics said it is not ambitious enough to prevent the dangerous effects of global warming. The Paris deal aims to limit a rise in average world temperatures to “well below” two degrees Celsius. 2018 saw the death of two great American Republicans, President George H Bush and Senator John McCain, who both represented decency and consensus in US politics and who believed in a global leadership role for America. Bush was probably America’s best foreign policy President as a result of his management of the end of the Cold War and the way he put together an international coalition to end the Iraqi occupation of Kuwait. Both were critics of Trump.